Magazine Street, from the natural perfume line Strange Invisible Perfumes, "celebrates the cultural melange of New Orleans", and a portion of the proceeds go to commongroundrelief, a charitable organization working to rebuild communities in the gulf coast area in the wake of Hurricane Katrina. 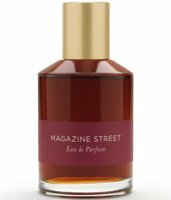 The notes are magnolia, vanilla, patchouli, vetiver and botanical musk, and Strange Invisible Perfumes characterizes Magazine Street as "brazen, sumptuous". Strange Invisible Perfumes Magazine Street is available in Parfum (7.5 ml) or Eau de Parfum (50 ml, shown). For buying information, see the listing for Strange Invisible Perfumes under Perfume Houses. More reading: an interview with Alexandra Balahoutis of Strange Invisible Perfumes. Dear Robin, My jaw dropped when I read this. I have been to new orleans some 10 plus years ago, and I must say that one of the most intense memories of my life is walking towards magazine street near midnight, crossing it by polynnia and smelling the incredible scent of magnolias, green folliage, some citrus-tinged jasmine, and .. the night. I understand completely someone wanting to capture that. OMG, I think I am all set for a “buy-unsiffed” occurence! P, if the florals were stronger, it would remind me of NO more…as it is, I'm not sure it really does. Still, it's lovely, and I've seen several people mention that it's their favorite from SIP. Not a cheap unsniffed buy though…like many natural brands, this one is expensive! For three years, I lived one block off Magazine Street. Must try. With a name like that, it should be a hot-weather scent. Lucky you! Do any of the Hove or Bourbon French perfumes remind you of NO? You can buy a sample for $5 from their website. I'm wearing this today, to anticipate my visit to NO for thanksgiving! I like the scent, but it really didn't last more than 3 hrs on me. Question: Anyone familiar with Hove? I'd love to dive in when I'm there, but would like a rec to start. Appreciate ideas! Natural perfumes don't usually have great staying power, unfortunately. Hove Tea Olive is a nice osmanthus — rather sweet & heavy, but nicely done. I haven't tried anything else from the line — I'm more familiar with Bourbon French (although I've only tried a handful or so from BF). well, I'll just have to try Bourbon French too. I just found out about them thru this site. Do! And have a great trip — and eat something wonderful for me. I am getting hungry just thinking about NO. I'm sure I can squeeze in a goodie or two! I enjoy the site and your sharing your knowledge!